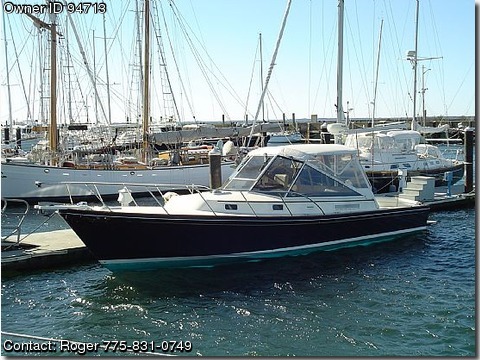 Call Boat Owner Roger 775-831-0749. Description: 38' Express Cruiser, cruise 28 kts max 34 kts, engines and Hamilton 273 jet drives just serviced, fully equipped, radar, chartplotter, micro, refrig, invertercharger, liferaft, winter cover, too much to list. ‘TIGRE’ Ted Hood Deep-Vee design Little Harbor WhisperJet 38 Hull #23 Built 11/1999 – 38’ LOA, 12’6” Beam, 22” Draft,19,000 lbs disp, 28 kts cruise, 31 kts max, fuel cap. 300 gal, fresh water cap 65 gal, twin Yanmar 350HP diesels 650 hrs. CABIN:Solid cherry hull ceiling, trim, locker frames, drawer fronts and corner posts with hand-rubbed finish. Roller bearing drawer slides and kroon flush positive latches. Ocean Frigast swivel reading lights. Ocean Air blinds and screens on Lewmar aluminum ports and hatches. Forward V-berth with 4” cushions and custom fitted sheets converts to large king. Below V-berth access to bow thruster and deep storage. Shelves and lockers above V-berth. Hanging closets port and starboard aft of V-berth with cedar lining. Single quarterberth/settee aft of V-berth to starboard with storage below. Single seat forward of galley to port. GALLEY: Norcold 12VDC/110VAC 3.5 cubic foot refrigerator. GE Microwave oven on shelf. Corian countertops and Formica bulkheads. Stainless galley sink with Grohe H/C faucet. Pressurized water system, Indel 6 gallon water heater, heat exchanger and 750W 110VAC element. Storage lockers outboard of galley counter. Large Cabinet below sink and three drawers to right of sink. HEAD: Manual Marine Toilet with holding tank system and macerator pump. Tankwatch III holding tank level monitor. Stainless steel sink in Corian counter. Molded floor pan has removable grate and drain pump with float switch. Chrome towel bar and adjustable shower rod. Opening Lewmar port with blind and screen, Nicro solar fan. BRIDGE DECK: Excellent Electronics at Ergonomic Helm Station with Pompanette helm chair. Aluminum windshield with varnished teak interior trim. Teak bridge deck sole with engine room hatch. Bridge deck sole lifts on electric screw jack for engine access. Stamoid canopy with removeable Isinglass curtains or screens. L-settee with teak table converts to king-size bunk. Teak and Lexan “Sailboat Style” companionway doors with teak folding hatch. ELECTRONICS: Northstar 961 XD DGPS Color Chartplotter upgraded CPU 2007. Raytheon ST60 Wind Instrument; speed, direction, apparent. Raypilot Autopilot with joystick power steering. Shipmate RS 8300 VHF radio. KVH Azimuth 1000 Electronic Compass. Alpine AM/FM Stereo, CD Changer, remote. Remote Control Searchlight mounts on bow rail. MECHANICAL: Twin Yanmar 6LYA-STE 350HP Turbo Diesels. Hamilton 273 Jet Drives with Hydraulic Bucket Controls. Wet exhaust with discharge through transom. Morse Throttle/Clutch and Bucket Controls. Bonded Bronze thru-hulls and strainers. Two 150-gal welded aluminum fuel tanks. Bennet Trim Tabs and indicators. Fireboy Halon engine room extinguisher and indicator. Three automatic bilge pumps and high water alarm. Electron Guard Corrosion Control System. Wipers with fresh water washers. ELECTRICAL: In accordance with ABYC standards. 12VDC/110VAC control and distribution panel with voltmeter and ammeter. Panel has provision for generator switchover. Split fire retardant cable conduits. Power applied and reverse polarity indicators on AC. Galvanic Isolator. 12VDC Cabin Lighting. 12VDC outlets at helm and in cabin. Courtesy light in cabin and cockpit. Carbon Monoxide detector. 110VAC outlets with GFCI in head, galley, and pilothouse chart desk. Spare wire conduits for AC and DC systems. 2500 Watt Trace Inverter/Charger with Control Panel. Two Group 24 Starting Batteries (charged by port engine alternator). Four Group 31 House Batteries (charged by stbd engine alternator). Insulated 4/0 Battery Cables with Fireproof Jacket . Marinco Shore Power Cord 10 GA 50’ 110VAC/30A with 50A/30A and 15A/30A adapters. Guest maintenance smart charger float charges house and starting batteries. DECK EQUIPMENT: Polished Moondust non-skid gelcoat deck. Molded rub rail with stainless guard. Fiberglass bowsprit with anchor roller. Bruce galvanized 33 lb. anchor with chain and rode. Molded anchor locker with washdown inside Lewmar opening hatch. Stainless bow pulpit and rails. Teak cap rail with stainless chafe guards and fender cleats. 2 bow chocks. 6 stainless steel mooring cleats. Miscellaneous dock lines. 6 fenders with fleece covers. Ensign and burgee flag staffs. Life ring buoy. 12 USCG approved life vests. MISCELLANEOUS: Marine Air 12,000 BTU/HR air conditioner/reverse cycle heater with outlet in cabin and on bridge deck. Espar heater with outlet in cabin and on bridge deck – new motor 2010. West Marine Inflatable Dinghy with 3.5HP Nissan Outboard. Jet drive maintenance and bottom paint done Dec. 2012.